Retractable Hand Roll Banners are HERE! 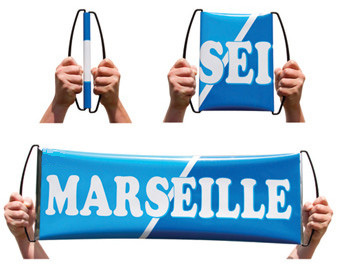 If you want to cheer on your team or advertise your brand you have come to the right place for retractable hand banners. We offer hand banners in the most popular size - 27.5" wide x 9.5" high. Pricing is based on quantity and the number of colors printed on each side. The banners are white so white is a free color. Print just one color on one side or print 4 color process on both sides. Absolute minimum order is 100 banners for printed orders. 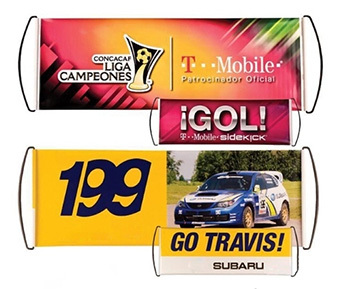 Retractable hand banners are ideal for anyone wanting to either cheer on their team, sell as a fundraiser, use at corporate events, college recuriting packets, travel agents, or product advertising. Banners are lightweight, easy to carry, roll up and low cost. Shown is a 2-color imprint (light blue and medium blue). Roll Banners are printed in up to 4 PMS (Pantone) spot colors on one side or two sides. Size:27.5" x 9.5"
You wanted longer banners, now we have it. This is our largest retractable hand banner. Minimum order quantity is 100. Shown are two 4 color process banners. Any banner that has photos or halftones has to be printed as 4 color process. 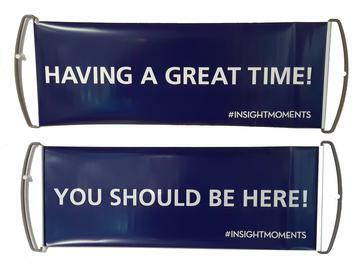 Size: 27.5" x 9.5"
Mini Retractable Banners 18" x 6.7"
something smaller, a more personal message. Banner pricing is based on the quantity ordered, the number of colors imprinted on 1 or 2 sides. Setup charges are $65.00 per color per side. 4 color process setup requires 4 setup charges of $65.00 each. Please note that we print both sides of the banner at the same time if your request a 2 sided imprint. Therefore, we need to make 2 sets of plates even if you want the same imprint on both sides. Price for 1 or 2 colors on 1 side only, or 1 color printed on 2 sides. Price for 3 or more colors on 1 or 2 sides. FREE Shipping on ALL printed orders to one location in the USA!! Banner pricing is based on the quantity ordered, the number of colors imprinted on 1 or 2 sides. Setup charges are $90.00 per color per side. 4 color process setup requires 4 setup charges of $90.00 each. Please note that we print both sides of the banner at the same time if your request a 2 sided imprint. Therefore, we need to make 2 sets of plates even if you want the same imprint on both sides. NOTE: Blank retractable hand banners do not ship free and ship from the USA in 1-2 days. After proof approval, your banners are delivered in 20-25 days for quantities of 100 to 3000 banners. All orders are printed in China and shipped to the USA. Contact customer service about rush orders. The soonest rush order that can be delivered is 15 days and may require a rush charge. 6: Great team fundraiser !!!! 10: Great for CO-OP advertising. Add a team sponsor or two. What makes the hand banners so attactive is their low cost, large imprint area and compact size when retracted. Banners are 10.25" tall x 2" wide and weigh just 1 oz when closed. Made of PET and plastic handle, this is an innovative, hand held, self rolling banner that springs back by itself. You can show off either side of this unique product in the stands, or in your office or car using suction cups. Perfect for easy carrying into your favorite stadium. Can be reused over and over. 1: Decide is you want a 1 or 2 sided imprint as shown in our video or gallery images. 2: How many colors do you want to print on each side. To get started, please fill out the form in the link below. We do NOT accept payment on this website. We start all orders using the banner quote form and if you have artwork for each side of the banner please upload it. Our setup charge is $65.00 per color per side. 4 color process requires 4 setup charges and is needed for more than 4 spot colors, photos or halftones. If you do not have artwork we have a graphics department that can help you with your design. Submit Banner Quote form and Artwork Files if available. We prefer vector files such as Adobe Illustrator .ai or eps or PDF's. Submit jpg's or png if that is all you have. File conversion to vector files is $10.00 per side which is needed for production. Depend on Lynmar's 24 years of experience to get your order done quickly and on time. No hiddens fees or charges, NO sales tax on any order and FREE shipping on all printed retractable hand banners to one location in the USA. Banner Quote Form - click here. Suction cups can be added to the handles at the time of manufacture for $0.15 per banner. Please note that the suction cups can only be removed by cutting them off. We recommend use on glass surface only. All orders must be paid for my credit card at the time the order is placed. The only exception to this is for prearranged payment terms for Universities and Government offices that require purchase orders. If you have special payment requirements please contact our office at 800-884-8095. Click here to view completed banners from 1 color, 2 color to 4 color process. Retractable Hand Banners is just another great website from LYNMAR Enterprises, Inc. We offer all promotional items at our main website www.lynmar.com.